Kanno comes in both a countertop and under-the-cabinet mount design to compliment any kitchen space. Having something that simply dispensed spices without me having to touch it would solve this problem, and when I started searching, I realized nothing exists on the market. Today, Kanno, an automatic and hands-free spice grinder designed to eliminate the spread of bacteria in the kitchen and make seasoning meals almost effortless, launched on Kickstarter with a funding goal of $25,000. During food preparation, bacteria can easily be transferred from one food to another through hands, work surfaces and utensils. With hands-free spice grinding, consumers can eliminate the spread of harmful bacteria in the kitchen. Activated by a finely-tuned lidar sensor, Kanno will start grinding when a plate is placed under the sensor, and it will stop dispensing when the plate is lowered away from the sensor, preventing excess pour or spillage. Kanno comes in two different models and can either be placed on a countertop or mounted underneath a cabinet. The countertop double stand option, made with powder-coated steel, raises the grinder off the countertop to evenly distribute spices onto a plate. The double stand will keep the canisters optimally spaced apart with arms that pivot to the side for easy access of different spices. 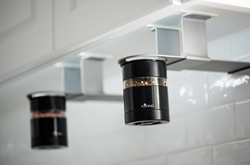 The under-the-cabinet mount option features an adjustable slide that lets users pull the grinder in front of the cabinets or push it back for more discrete use and storage. It conveniently mounts to any standard size kitchen cabinet. The seasoning dispenser can not only function hands-free, but it can also be used as a traditional push-button device — perfect for guests gathered around the table. Powered by four AAA batteries, Kanno can grind and dispense spices at the grain size of one’s choice with various coarseness settings. Starting at just $69, avid cooks worldwide can rejoice as Kanno will now make seasoning meals nearly effortless. To learn more, visit pr.go2.fund/kanno. Kanno was created out of the desire to save time, eliminate the spread of bacteria, and make seasoning meals almost effortless. With Kanno, seasoning food will be far simpler than ever before—and far more sanitary. To learn more, visit https://producthype.co/kanno.